Where did you get it? It was a Christmas gift when it first came out in hardcover. It won the National Book Award for Fiction in 1999. Why did you read it? My book club chose it for our March discussion. I’ve had it on my shelves for years, and this was my second reading. What’s it about? 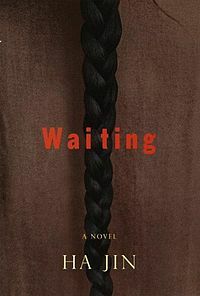 Based on a true story the author heard from his wife on a visit to China, Waiting is about a doctor who waited 18 years to divorce his wife so that he could marry a co-worker at the army hospital where they both worked. Following parental and societal expectations, Lin Kong enters into an arranged and loveless marriage with the traditional Shuyu, an older woman who was willing to care for his ailing mother. Lin works in an army hospital in the city, where he forms a bond with a nurse named Manna. They are forbidden to be together and their every move is watched and dictated by the army. Each year on his annual visit to the countryside to visit his wife and daughter, he asks Shuyu for a divorce so that he might marry Manna, and each year something happens to prevent it. This is a tragic story, not a love story. Bound by custom and duty to both the loyal Shuyu and the more modern Manna, Lin feels trapped. He is indecisive, emotionally immature, repressed and unfulfilled. His guilty feelings over stringing Manna along and watching her become an “old maid” in the eyes of others had him trying to set her up with his cousin and promoting a relationship with a high ranking military official, both of which failed to materialize. Manna resigns herself to waiting for Lin. Finally, after 18 years, the law says he can divorce his wife without her consent, so he does. Conforming to expectations like good Comrades and following the rules, Lin, Shuyu and Manna are all waiting for a love that never really comes, and while they’re waiting, their lives pass them by. What did you like? The story was interesting. I noted some symbolism, which I generally like, even though some of it was a bit heavy handed. The writing was spare and straightforward, even blunt. I learned a lot about Chinese culture and the political climate of the time. What didn’t work for you? The author basically tells the entire story in the prologue. I would have preferred to discover it in the reading of the book, rather than have it handed to me in the first few pages. Some of the language is clunky in the way it might be if it was a translation, but it’s not. In fact, the author’s first language is Chinese, not English, and while it is all technically correct, sometimes his word usage is odd. The writing is quite restrained, which I suppose is reflective of the political climate, so perfectly appropriate. The plot is somewhat repetitive. And finally, Lin is such a passive character, I wanted to shake him. I’m not sure why any one woman would wait for him, let alone two. Who would enjoy this book? Anyone interested in Chinese culture and communism. Anything else to add? I liked this book a lot better the first time I read it, and I’m not sure why, but it was definitely a good choice for our book club, giving us a lot to talk about. Click HERE for discussion questions from Book Browse. I feel a little edgy just reading about his passivity! That poor woman. I find it curious that the author chose to tell the entire plot in the prologue. Still I find Chinese culture fascinating. I’m mentally shelving this one under “maybe”. They were all in an impossible situation, but it would have been nice to at least see some emotion about it. Get pissed off, buddy! Something!! If you find Chinese culture fascinating, I bet you’d like it. I had high hopes for this book because I loved another one of Jin’s books – A Free Life. I don’t like the idea of the whole story being told in the prologue of this one. I found it really odd. I liked the book, though, just wish it was set up differently. I read half of this book a long time ago, and had to give up for the reasons you mention. The passivity, the cruelty of what he does to his wife, and the symbolism was really overdone. I might go back to it one day, but I am not sure when. It really does seem that life passed him by with all the waiting. Hi Heather. I don’t know, I didn’t find him to be cruel to his wife. Neglectful, yes. Uninterested, definitely. But not cruel. He was dutiful in sending money, etc. and was kind to her. He just didn’t love her. I’ve also had this one on my shelves forever. I am still interested but the passivity might drive me a little nuts too. It did me, that’s for sure! I like a story to develop slowly and for me to get to figure it out. This would definitely be a weakness in the book that I would pick up on as well. Sounds like a good one for a book club discussion though.